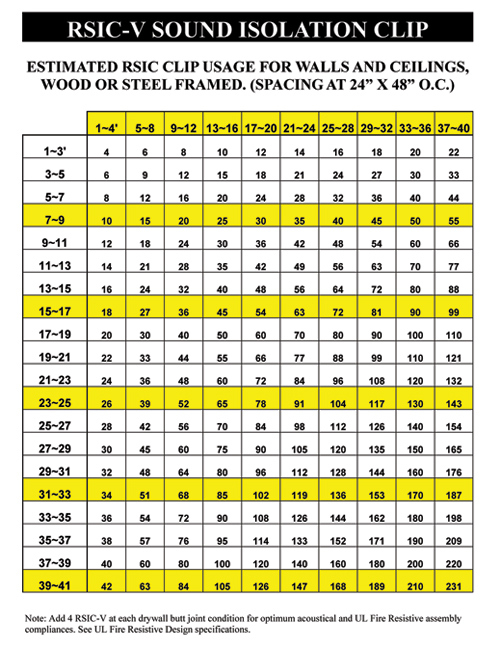 The RSIC-V™ is designed for use with various framing designs and applications. The RSIC-V™ limits the connection points between the gypsum board and the structure in walls and ceilings. The RSIC-V™ has been acoustically tested in wall systems and adds the assurance that your projects acoustical performance will improve drastically. 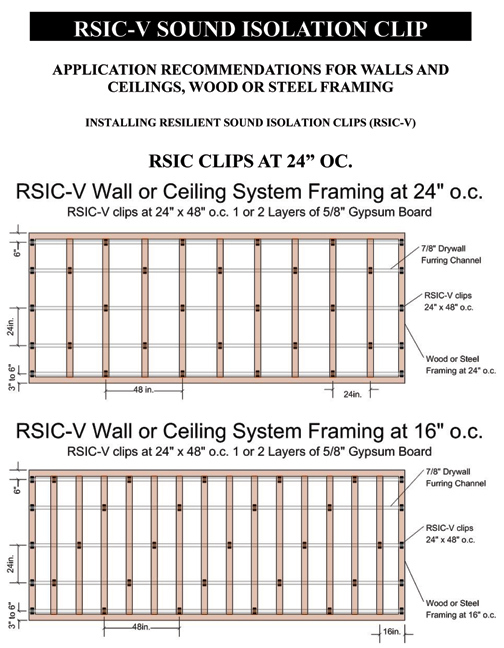 WALL DETAIL – RSIC-V CLIPS AT 24″ OC. 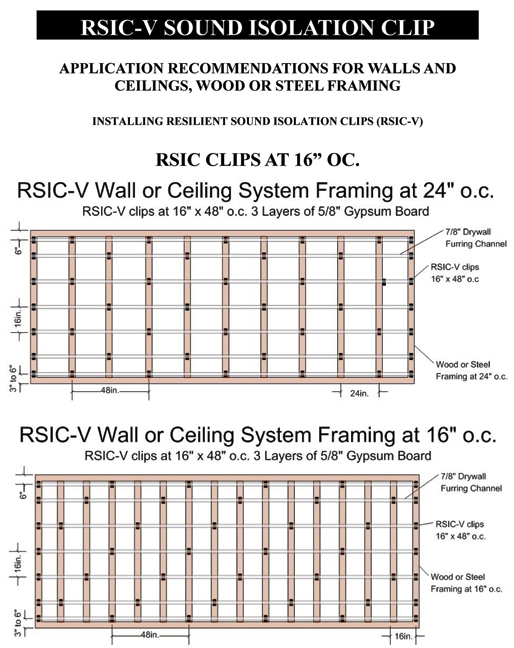 WALL DETAIL – RSIC-V CLIPS AT 16″ OC. Fasten the Resilient Sound Isolation Clip (RSIC-V) to the substrate with a fastener approved for a minimum pull-out and shear of 120 lbs. 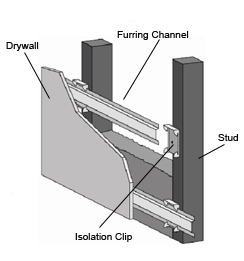 Snap in the drywall furring channel (hat track) into the RSIC-V clips (horizontal for walls). 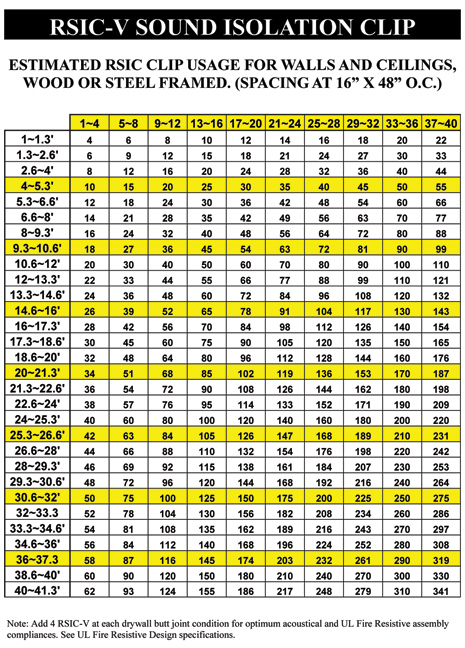 Install the gypsum board from the bottom up leaving a 1/4″ min. gap around perimeter of wall. ONLY remove the shims after ALL the gypsum board is completely screwed to ALL the drywall furring channels. Make sure every screw (floor to ceiling and wall to wall) is installed as required by the assembly design, in every layer of gypsum board before removing the shims at the floor. The shims are critical to ensure best results. Caulk around the perimeter of the wall. Use fire and smoke rated acoustical sealant where required.